The Montrose wall mirror offers a sophisticated look for your room decor. This gorgeous mirror has the appearance of a treasured heirloom piece with its oval shape and rich mahogany wood tone finish. Inner and outer edges of the frame are detailed in antiqued silver and a dark gray wash.
25" wide x 35" high x 1 1/2" deep. Hang weight is 29 lbs. Glass only section is 20" wide x 30" high. Surrounding frame is 2 3/4" wide. Beveled edge is 1 1/4" wide. 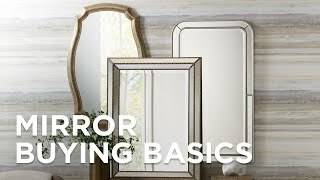 Montrose wall mirror from Uttermost. Distressed, dark mahogany finish with a dark gray over-glaze. Antiqued silver finish details. MDF and glass construction.